Saw Vanilla and Strawberry Cheesecake flavour in my store, but bigger branches may have a wider selection. 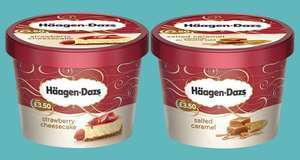 They're the 300ml size (not the tiny scoop sized tubs) which have a price marked on them at £3.50, so 200ml less than a normal tub but the price per ml means if this was a full sized 500ml tub - it would be £1.67. Seeing as the big tubs rarely fall below £3 in most shops, it's not a bad deal at all! I don't understand the concept of printing best-before date on ice-cream. They don't last that long. I don't understand the concept of printing best-before date on ice-cream. …I don't understand the concept of printing best-before date on ice-cream. They don't last that long. HEAT!! And surely they are kept in the freezer as well. I'm going hunting for them tomorrow. Heat! Only Strawberry Cheesecake or Vanilla in Hartlepool store. Got 2. Nom nom nom! !